As part of the LSE EUROPP series on the Dahrendorf Symposium. The EU’s Emissions Trading Scheme (EU ETS) aims to reduce greenhouse gas emissions using a ‘cap and trade’ system, in which levels of emissions are capped, but participants can buy and sell allowances as they require. Godefroy Grosjeanand Robert Marschinski note that the system has been undermined due to the price of permits falling drastically since 2008. They provide an overview of some of the potential options available for reforming EU ETS, including the creation of an independent carbon authority analogous to an independent central bank. As the permit price of the European Union Emissions Trading Scheme (EU ETS) crashed after 2008, falling from above 25 euros to 5 euros, so did the credibility of this market as the main pillar of European climate policy. Some analysts argue that with such a low price the incentive for further abatement is practically zero, and that the trading scheme should be either reformed or scrapped. Even the European Commission has proposed six different reform options, including a one-off reduction of the cap (annual maximum amount of permissible emissions), an extension of the scheme to other sectors (e.g. transport), or a price management mechanism (e.g. minimum price). However, these options are not well suited to provide flexibility to respond to “unknown unknowns” that could again in the future destabilise the market. To achieve such flexibility, the creation of an independent management body for the carbon market was suggested by some scholars, who point to the positive experience with such an institution in monetary policy. In fact, delegation to an independent central bank has emerged as an effective way to overcome the inherent trade-off between short-term gains from a generous supply of money and long-term losses from higher inflation. Similarly, in climate policy, a trade-off between short-term growth and long-term gains from abatement might exist and thus motivate delegation to an independent carbon authority. The idea of applying delegation to climate policy first emerged ten years ago, however, since then it was confined mostly to academic circles. Only recently has the concept gained more traction, leading the European Commission to explicitly ask for further research on its feasibility. Although the theoretical rationale for delegation is rather uncontested, a definite prescription of this medicine to the EU ETS must be preceded by a proper diagnosis of why the low price is problematic and whether it reflects a failure that delegation could correct. What is the actual problem with the current price? The price of carbon in the EU ETS is without doubt lower than the model projections which informed the process that led to the EU ETS directive. From a theoretical perspective, three different – and not mutually exclusive – drivers could have contributed to the sharp drop below the expected level. First, unforeseen exogenous changes in demand or supply, namely the economic crisis and the supplementary climate policies for renewables and energy efficiency, reduced baseline emissions and hence demand for permits. Second, the insufficient credibility of the announced European long-term commitment towards ambitious emission cuts might have undermined an inter-temporal smoothening of the price drop. Third, an inherent malfunctioning of the market due to market power or other economic ‘imperfections’ (e.g. asymmetric information between firms and regulator) might have exaggerated the cost of compliance to obtain a (too) lenient cap. Potential remedies for the low price and the exact reforms which are needed are fiercely debated, with a wide array of reform proposals being launched, ranging from a one-off change of the cap to delegation to a new institutional body. To reduce the complexity of this puzzlingly rich menu of options, we propose to map them onto an “EU ETS Reform Matrix” along two essential dimensions: the degree to which they increase control over the permit price and the degree to which they delegate the management of the carbon market to an independent authority. The first represents the instrumental change, the second the institutional adjustment embodied by the reform. Three levels of delegation are conceivable: (i) the status quo, with oversight and control of the carbon market remaining in the hands of EU institutions; (ii) delegation to an independent authority that applies rule-based mechanisms (e.g. a price corridor or “Taylor” like formula) to adjust the cap; and (iii) delegation to a ‘carbon central bank’-like entity with a high level of discretion to achieve a predefined long-term goal (e.g. cheapest decarbonisation of the European economy by 2050). This framework is shown in the image below. Note: The figure shows potential reforms to the Emissions Trading Scheme along two dimensions. 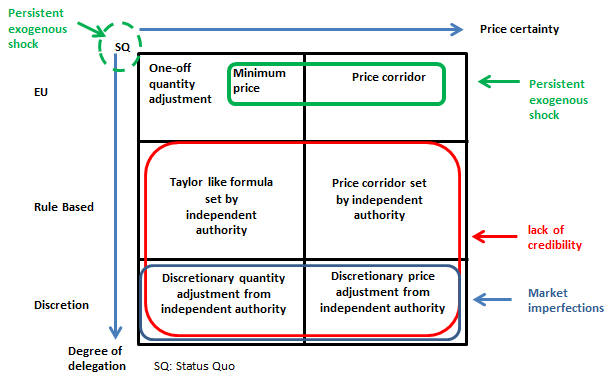 The arrow at the top of the figure shows the degree to which a reform increases control over the permit price (the higher the control, the further the reform is located to the right). The arrow on the left of the figure indicates the degree to which a reform would delegate authority to an independent body (the lower the reform, the greater the powers delegated). As can be seen in the Figure, this ‘EU ETS Reform Matrix’ can accommodate a variety of prominent reform proposals, and displays a visualisation of their essential differences and similarities. Depending on what is perceived as being the primary problem with the EU ETS, effective policy responses can be narrowed down to a certain area within the reform matrix. For example, if one views the EU ETS as a tool to achieve an emission target at the lowest cost then no reform is necessary. If one perceives the current price drop to be an outcome of the economic crisis alone, but also wants to achieve a minimum price of carbon to trigger innovation, then delegation is not necessary. The implementation by the EU of a price floor or corridor should suffice. However, if the credibility of long-term commitments is the relevant concern, then only options with some degree of delegation should be considered. Higher levels of discretion might also decrease the risks associated with market imperfections. For instance, the flexibility given to the regulator might make it harder for firms to behave strategically and take advantage of asymmetric information. Within these two option sets (in red and blue in the matrix), the degree of orientation towards more or less price certainty is ultimately a political choice reflecting the objectives – which might be broad or rather narrow – of the EU ETS. To sum up, many reform options for the EU ETS have been put forward over recent months and delegation is increasingly seen as a real reform option. However, before deciding on the preferred way to go, it is high time for policy-makers to declare what exactly they expect the EU ETS and EU climate policy in general to deliver. Is it to achieve a specific emissions target, or to transform the EU into a technological leader able to decrease other countries’ abatement costs, or both? The answer to this question cannot be given by academics alone, but requires a wider public debate. As a next step, policy-makers should evaluate whether the real drivers of the low price are conflicting with their stated goals for the EU ETS and then choose the appropriate response accordingly. This post first appeared on LSE EUROPP Blog. Godefroy is a Researcher working on climate change economics and policy, with a focus on the reform of the EU ETS, for which he is funded by the EU FP7 project ENTRACTE (308481). Godefroy is a PhD student of Prof. Ottmar Edenhofer. Robert is a Senior Researcher working on climate change economics and policy, and a member of Dahrendorf Working Group 4: Economics and Climate Change. This entry was posted in Cold War. Bookmark the permalink.